This article is about typography. For the stock market "small cap", see Market capitalization. In typography, small capitals (usually abbreviated small caps) are uppercase (capital) characters set at the same height and weight as surrounding lowercase (small) letters or text figures. They are used in running text to prevent capitalized words from appearing too large on the page, and as a method of emphasis or distinctiveness for text alongside or instead of italics, or when boldface is inappropriate. For example, the all-caps TEXT IN CAPS appears as text in caps in small caps. They can be used to draw attention to the opening phrase or line of a new section of text, or to provide an additional style in a dictionary entry where many parts must be typographically differentiated. Well-designed small capitals are not simply scaled-down versions of normal capitals; they normally retain the same stroke weight as other letters and have a wider aspect ratio for readability. Typically, the height of a small capital will be one ex, the same height as most lowercase characters in the font. In Anglo-Saxon typography, small caps are somewhat larger than the x-height. 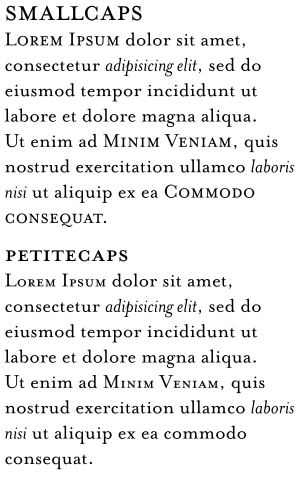 For example, in some Tiro Typeworks fonts, small caps are 30% larger than x-height, and 70% the height of full capitals. To differentiate between these two alternatives, the x-height form is sometimes called petite caps, preserving the name "small caps" for the larger variant. OpenType fonts can define both forms via the "small caps" and the "petite caps" features. Because the support for the petite caps feature is absent from most desktop-publishing programs, many fonts use x-height small caps in the small-caps feature. Many word processors and text-formatting systems include an option to format text in caps and small caps, which leaves uppercase letters as they are, but converts lowercase letters to small caps. How this is implemented depends on the typesetting system; some can use true small caps associated with modern professional fonts, making text such as "Latvia joined Nato on March 29, 2004" look proportional; but less complex digital fonts do not have a small-caps case, so the typesetting system simply reduces the uppercase letters by a fraction, making them look out of proportion. A work-around to simulate real small capitals is to use a one-level bolder version of the small caps generated by such systems, to match well with the normal weights of capitals and lowercase, especially when such small caps are extended about 5% or letterspaced a half point or a point. Small caps are often used for sections of text that is all uppercase; this makes the run of capital letters seem less jarring to the reader. For example, the style of many American publications, including the Atlantic Monthly and USA Today, is to use small caps for acronyms and initialisms longer than three letters—thus "U.S." in normal caps, but "nato" in small caps. The initialisms ad, bc, am, and pm are often smallcapped. In printed plays and stage directions, small caps are usually used for the names of characters before their lines. French and some British publications use small caps to indicate the surname by which someone with a long formal name is to be designated in the rest of a written work. An elementary example is Don Quixote de La Mancha. Similarly, they are used for those languages in which the surname comes first, such as the Romanization Mao Zedong. In many versions of the Old Testament of the Bible, the word "Lord" is set in small caps. Typically, an ordinary "Lord" corresponds to the use of the word Adonai in the original Hebrew, but the small caps "Lord" corresponds to the use of Yahweh in the original; in some versions the compound "Lord God" represents the Hebrew compound Adonai Yahweh. In zoological and botanical nomenclature, it is common use to print names of the family group in small caps. The Bluebook prescribes small caps for some titles in United States legal citations. In many books, when one part of the book mentions another part of the same book, or mentions the work as a whole, the name is set in small caps (sometimes with normal capitals for the initial letters of certain words in the title), not italics and not roman type within quotation marks. For example, articles in The World Book Encyclopedia refer to the encyclopedia as a whole and to the encyclopedia's other articles in small caps, as in the "Insurance" article's direction, at one point, to "See No-Fault Insurance", "No-Fault Insurance" being another of the encyclopedia's articles. George Eliot's 1856 essay "Silly Novels by Lady Novelists" is critical of Victorian novelists for using excessive small caps and italics to indicate unnecessary emphasis. Professional desktop publishing applications supporting genuine small caps include Quark XPress and Adobe Creative Suite applications. Most word processing applications, including Microsoft Word, Pages and LibreOffice Writer, do not automatically substitute true small caps when working with OpenType fonts such as Hoefler Text that include them, instead generating scaled ones. These applications must therefore work with fonts that have true small caps as a completely separate style, similar to bold or italic. Few free and open-source fonts have this feature; an exception is Georg Duffner's EB Garamond, in open beta. Although small caps are not usually "semantically important", the Unicode standard does define a number of "small capital" characters in the IPA extensions, Phonetic Extensions and Latin Extended-D ranges (0250–02AF, 1D00–1D7F, A720–A7FF). These characters, with official names such as latin letter small capital a, are meant for use in phonetic representations. For example, U+0280 ʀ (HTML &#640;) represents a semi-voiced uvular trill. Superscript small caps are the following: ᶦ ᶧ ᶫ ᶰ ᶸ. Note that since these glyphs come from different ranges, they may not be of the same size, because few typefaces supply all of them. These "small capital" characters should not be confused with the Unicode Standard's typographical convention of using small caps for formal Unicode character names in running text. For example, the name of U+0416 Ж is conventionally shown as CYRILLIC CAPITAL LETTER ZHE. Since the CSS styles the text, readers are still able to copy the normally-capitalized plain text from the web page as rendered by a browser. CSS3 can specify OpenType small caps (given the 'smcp' feature in the font replaces glyphs with proper small caps glyphs) by using "font-variant-caps: small-caps;", which is the recommended way, or "font-feature-settings: 'smcp';", which is (as of May 2014) the most widely supported way. If the font does not have small-cap glyphs, lowercase letters are displayed. The OpenType font standard provides support for transformations from normal letters to petite caps by two feature tags, pcap and c2pc. A font may use the tag pcap to indicate how to transform lower-case letters to petite caps, and the tag c2pc to indicate how to transform upper-case letters to petite caps. Desktop publishing applications, as well as web browsers, can use these features to display petite caps. However, only a few currently do so. Some fonts, especially digitisations of older metal type designs, often lack small caps in bold or italics. This is because they were normally only used in body text and cutting bold and italic small caps was thought unnecessary. As of 2013, there is no direct support for petite caps in web pages using the Cascading Style Sheets (CSS) language, but the working draft proposal of 2011 by the W3C, describes CSS rules that would specify text presentation in petite caps, as well as many other typographic styles. ↑ "OpenType Layout tag registry". Microsoft.com. 2008-11-19. Retrieved 2014-05-15. ↑ Holman Illustrated Bible Dictionary. Nashville, TN: Holman Bible Publishers. 2003. p. 1046. ISBN 0-8054-2836-4. ↑ "What's OpenType?". Hoefler & Frere-Jones. Retrieved 11 August 2014. ↑ Duffner, Georg. "Design of EB Garamond". Retrieved 11 August 2014. ↑ ""Microsoft OpenType Layout tag registry"". Microsoft.com. 2008-10-08. Retrieved 2014-05-15. ↑ "OpenType feature support"". "Typotheque. Retrieved 2014-05-15. ↑ ""W3C Working Draft Proposal: CSS Fonts Module Level 3"". W3.org. Retrieved 2014-05-15. Willberg, Hans and Forssman, Friedrich (2010). Lesetypografie. Verlag Hermann Schmitz, Mainz. ISBN 978-3-87439-800-8. Bringhurst, Robert (2004). The Elements of Typographic Style (version 3.0). Vancouver: Hartley & Marks. ISBN 0-88179-205-5.